Hello again! Today I'm super excited to be creating with brand new goodies from The Stamp Market. I had the pleasure of meeting Amy, the owner of The Stamp Market, in Phoenix and she was one of my favorite people I met. I love the clean and bold style of her products and how they can still exude softness and beauty at the same time. I tried to mimic that in my creations today. Here's a video showing my process. 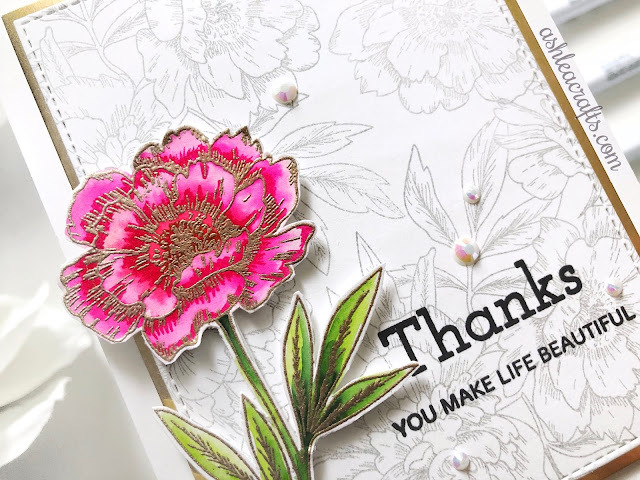 I was very inspired by Kristina Werner's recent video (click here for that) showing ink blends and how to choose colors that blend well together for an ombre effect. 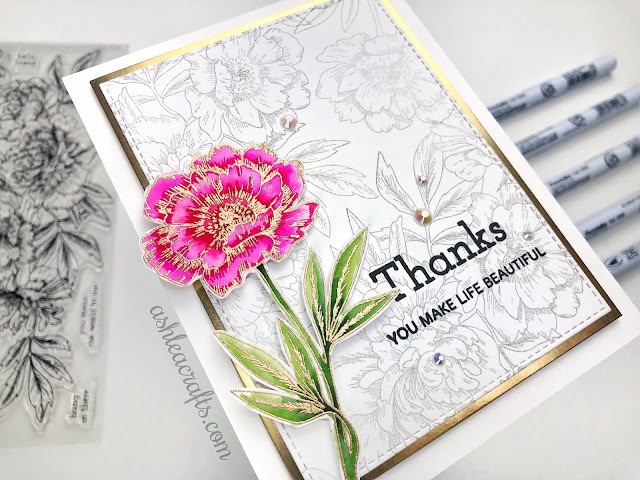 I took the tips I learned there and created a card panel that went from purple to a light orange color using Catherine Pooler inks. 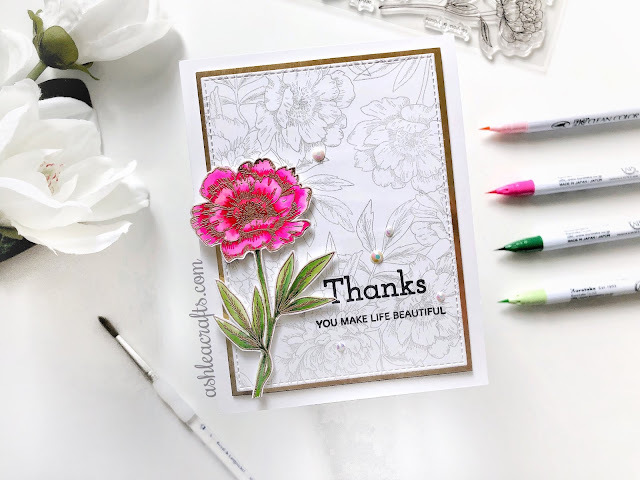 I then stamped the Diagonal Pinstripe background stamp onto my card panel using my MISTI so that I could stamp it again in order to emboss it twice. This gave a really bold look to the stripes and also gives a smoother look to the embossing. 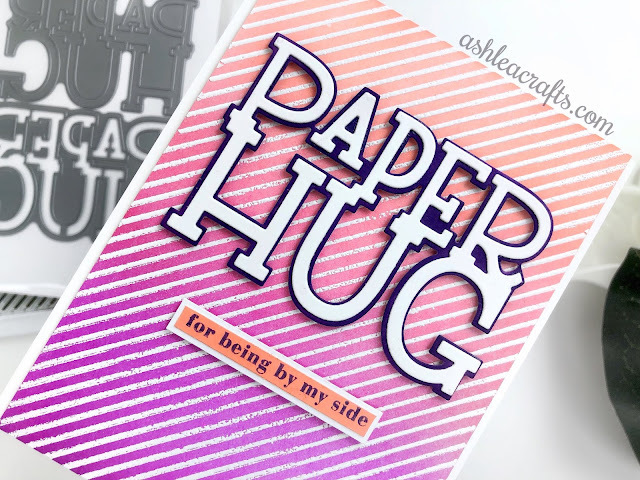 I decided to use the Paper Hugs dies to serve as my sentiment on my card front. I originally thought I'd like the word die to mimic the colors of the card panel, so I used the same three ink colors and went ink pad to paper making sure to overlap my colors so they created a blended new color when they mixed. 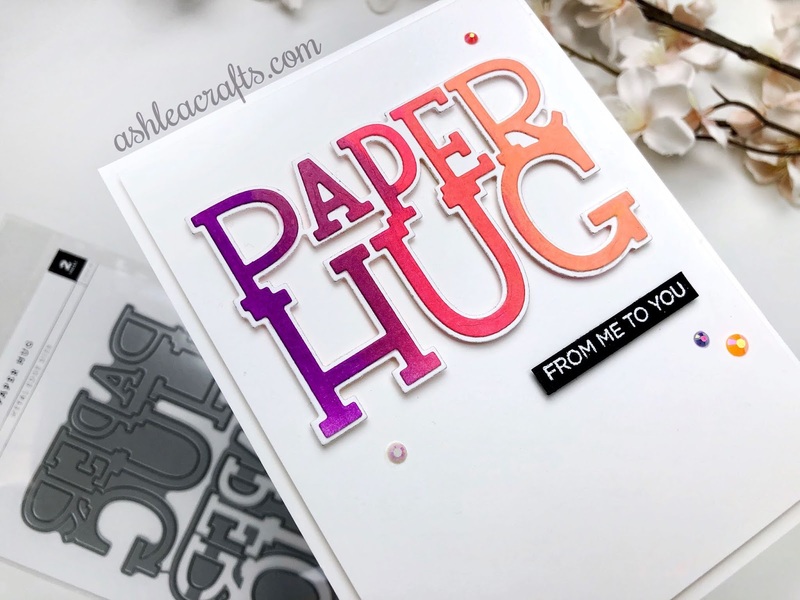 I placed the Paper Hug word die in the center of the ink blends in order to get each of the colors within the words. I adhered that to the shadow die that I die cut from white card stock and did a little "ooohhhh" to myself. SO PRETTY! Quickly, I realized that those colors just wouldn't work with my card front as it wasn't enough contrast but I knew that I couldn't throw it away. 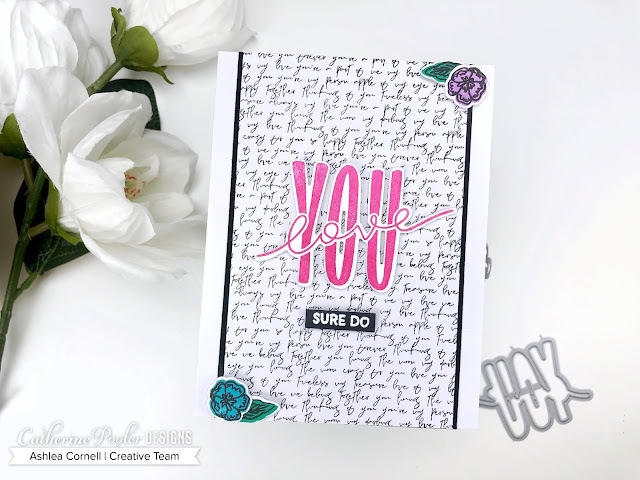 I adhered it to a white piece of card stock and added the "from me to you" sentiment from the Kindness Noted stamp set also from The Stamp Market. 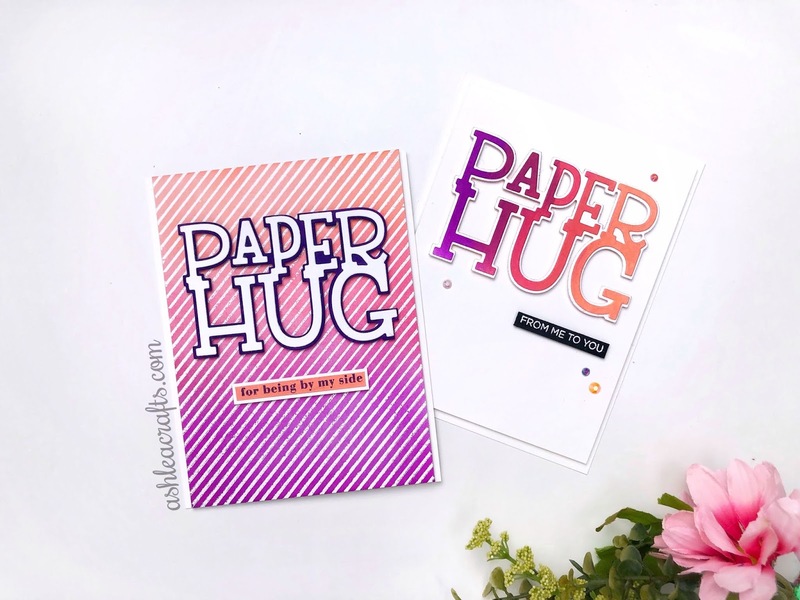 I realized that I needed a very bold and simple color palette for my Paper Hug sentiment on my Diagonal Pinstripe card, so I used a dark purple card stock for my shadow die and a crisp white card stock for my word die. 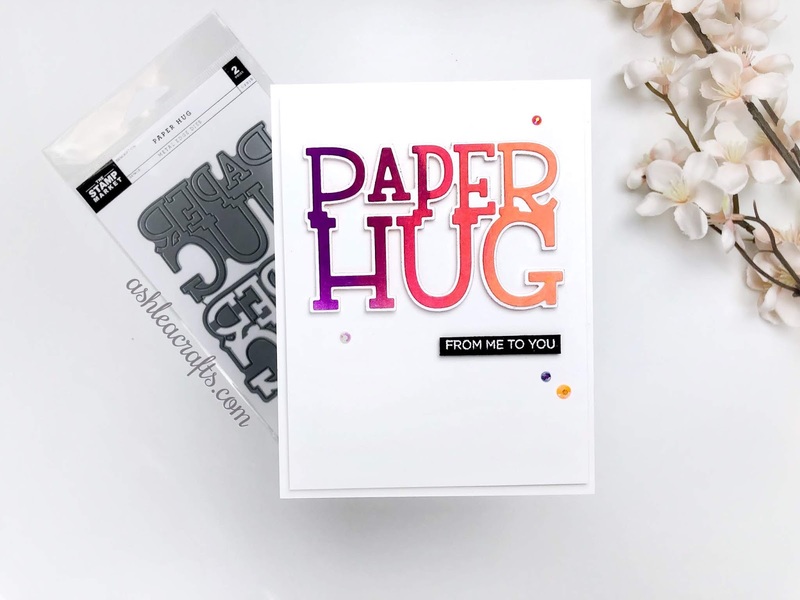 I then added the sentiment "for being by my side" also from the Kindness Noted stamp set and stamped that onto a piece of pale orange card stock. To help that strip stand out a bit more, I created a matted background for it with the same crisp white card stock and adhered it all onto my card front with foam tape. I hope that you've enjoyed learning a bit about how I created these cards. Honestly, the white card was a bonus as I hadn't planned creating it but I think it's actually one of my favorite cards ever. Happy accidents! 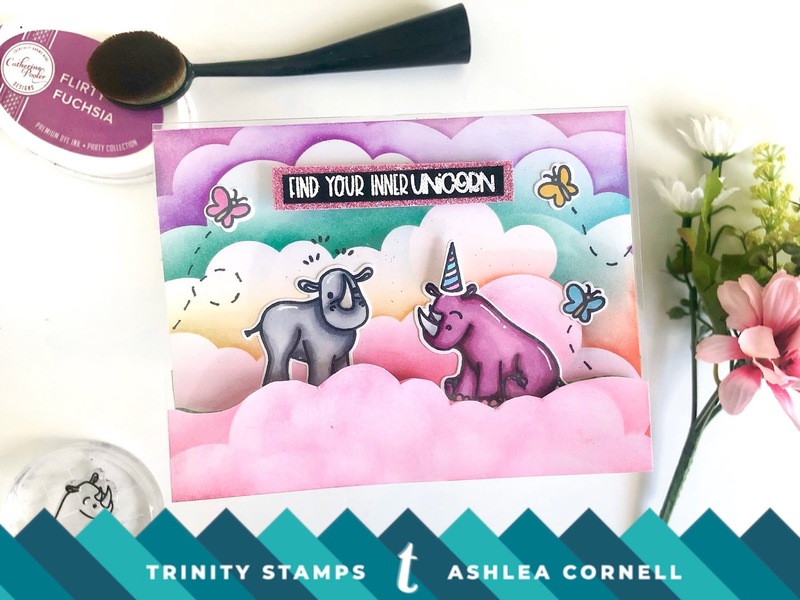 I would LOVE to see what you create with your products from The Stamp Market. If you'd like to share with me, drop your blog address or instagram name in my comments or just tag me (@ashlea_crafts) on Instagram. I'll see you very soon! I love being able to get more for my money and the supplies that I purchase, and this technique has very little waste which I also love. I've included a supply list at the bottom of this post as well as in the description of the video. 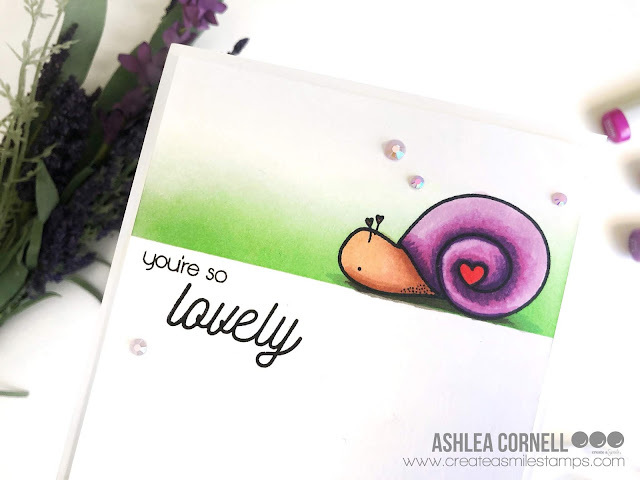 I hope that you've enjoyed learning a bit about how I used Therm-O-Web's Deco Foil Transfer Gel. 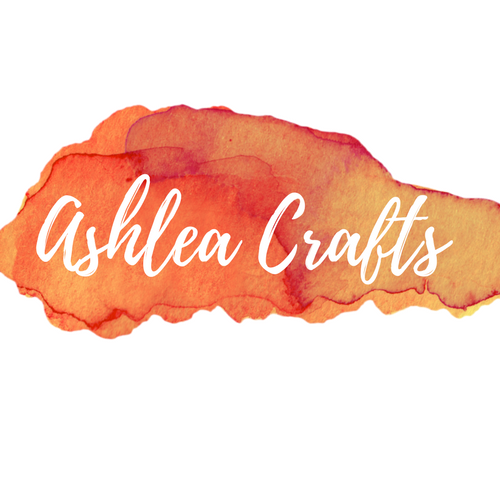 Let me know how you use it and please share your creations with me @Ashlea_Crafts on Instagram. See you soon! Hello, friends! 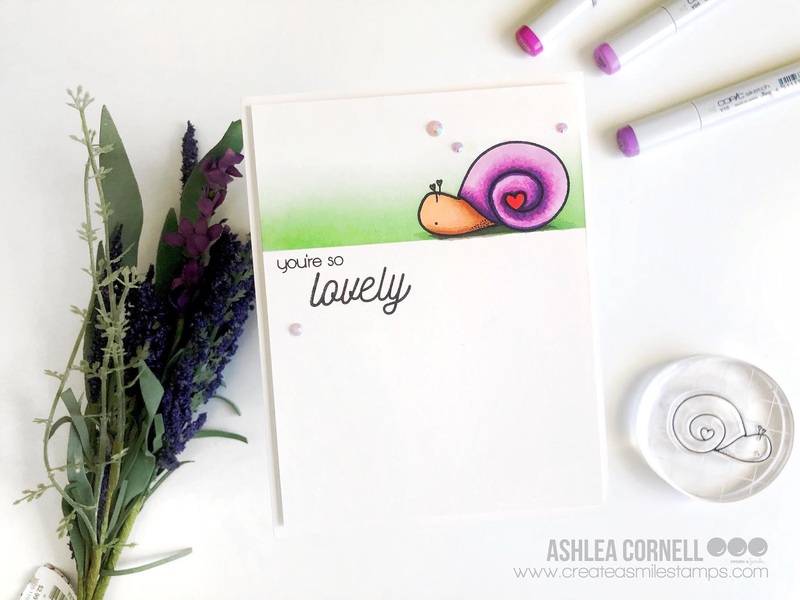 I have had a whirlwind weekend at Creativation in Phoenix, AZ but now it's back to reality and my first project is for the Create A Smile Challenge theme "L is for..."
Check out all the inspiration and enter your card here! I decided to keep it very simple this time with a minimal scene featuring this adorable heart snail from the Lovely Critters stamp set. I stamped and masked him off, then ink blended a bright green color as the grass he's slithering through. I then colored him in Copic markers and stamped the sentiment "You're So Lovely" right beneath the image. So, my "L" is for "lovely". 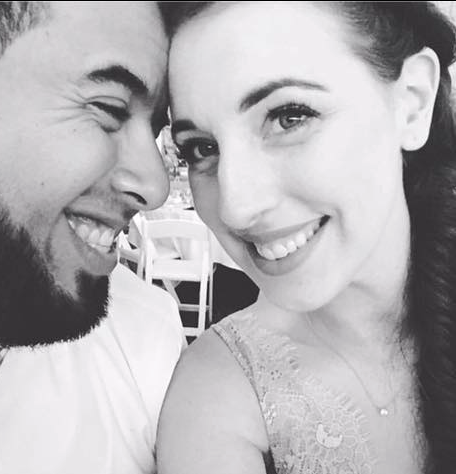 I hope you'l join us over on the challenge blog! You could win a gift certificate to the shop. So good luck! See you soon! 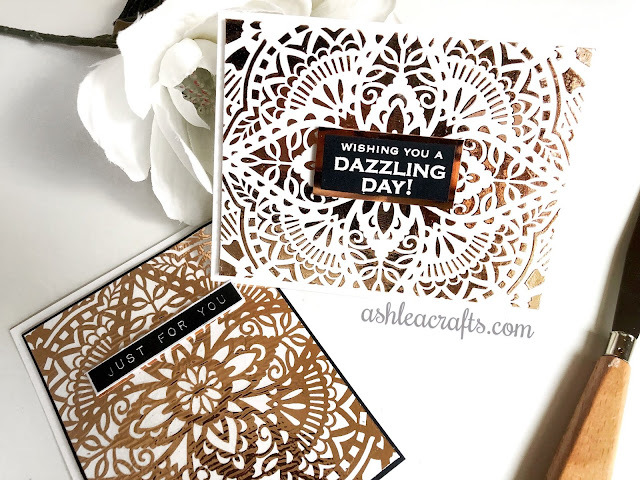 I love this style of card because it adds a little something and it a bit interactive but also easy to create! Thank you so much for stopping by! If you decide to give this card a try, I'd love to see it! Tag me on instagram @ashlea_crafts. HAPPY SOA DAY! I know I say it every time, guys. I know each and every Stamp Of Approval is my favorite but this one is seriously great. After a long holiday season, I am so excited to create with fresh new images and this SOA does not disappoint. 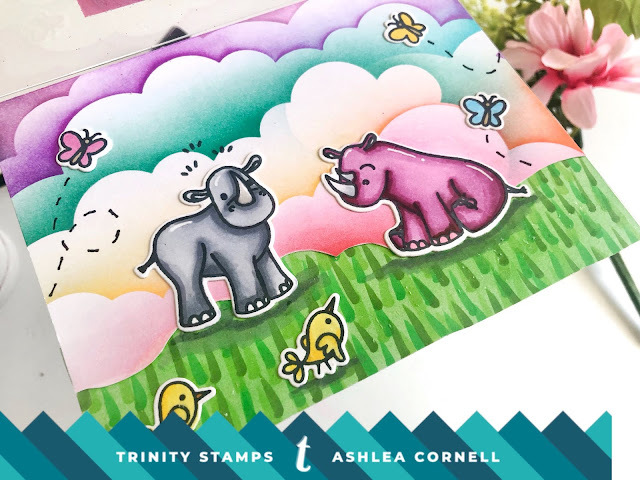 Before we get into the cards I created today, let's get into the details of what the Stamp Of Approval collection is for all you newcomers! The Stamp of Approval is a collection of stamps and dies that coordinate and work together. The products included in the collection are exclusive to the Stamp Of Approval and will not be available individually for many months. Once the collection is sold out, its gone! So if you're all gaga over the contents, don't hold back! 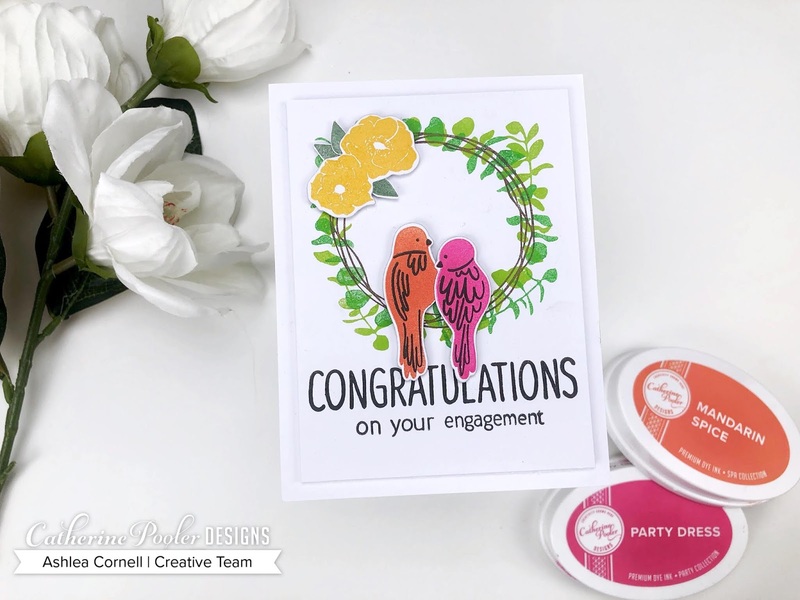 For my first card I used the Sweet Home Wreath stamp set, the Happy Together Stamp Set, and the Congratulations Sentiment stamp set. I knew I wanted this card to be bright and cheery because like I said, I was really looking forward to creating with bright colors as oppose to all those holiday cards I'd been making. I love that the wreath can be layered however you see fit. You can rotate the second layer several times wherever you like, so each wreath is different! The only thing you'll have to be careful of is die cutting the wreath. If you'd like it to be die cut, I'd suggest die cutting the first layer and then stamping the second and third layers after die cutting! For my second card today I used the Love Note background stamp and the Happy Together Stamp and die set. I absolutely love the teensy tiny print of this background stamp and Midnight Ink does such a wonderful job at catching that tiny detail. 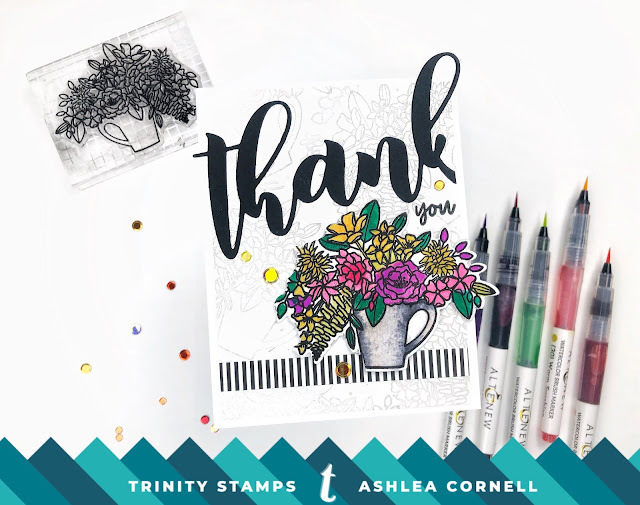 I'm also just head over heels for the "love you" stamp and die in the Happy Together stamp set. The die is so intricate and beautiful and some of the team has even been embossing the word love to give some contrast. I can't get enough! Click either SOA graphic above to be forwarded to the Stamp Of Approval Link! I can not wait to see what you all create with these beautiful products! Thank you so much for stopping by today! I'll see you again very soon! The Seasonal Sweetheart stamp set includes this adorable girl and lots of fun accouterment stamps that you can die cut and place inside the girls arms once you've cut her out using the coordinating die. The coordinating girl die cuts around her arms so they become free and you're able to slide the items inside her arms as if she is holding them, like you see here with the flower bouquet. I decided to use a masking technique with the flower stamp to create this bouquet and then fussy cut it and slid it into her arms. I used the new Blendability Brushes to ink blend the sky a nice pink color using Be Mine ink by Catherine Pooler. These brushes are my new favorite thing in my craft room at the moment. They blend seamlessly and SO easily and as a bonus, they have a flat bottom so that they store standing up! Once I'm done ink blending with one, I just rinse with water and allow to dry and then I can use it again with another color. No more storing those round sponges for every single ink color I have. These are a real game changer! I finished off the scene by stamping some silhouette trees from the Season's Greetings Silhouettes stamp set and adhered my girl and little bird with foam tape onto my card front. I hope that you've enjoyed learning a bit about how I created this card. Thank you so much for stopping by today and I'll see you again very soon! I love that the dies in the kit this month work beautifully together or separate. It makes it so easy to stretch them to lots of different designs and uses, and that's always something I look for when purchasing stamps and dies to create with. 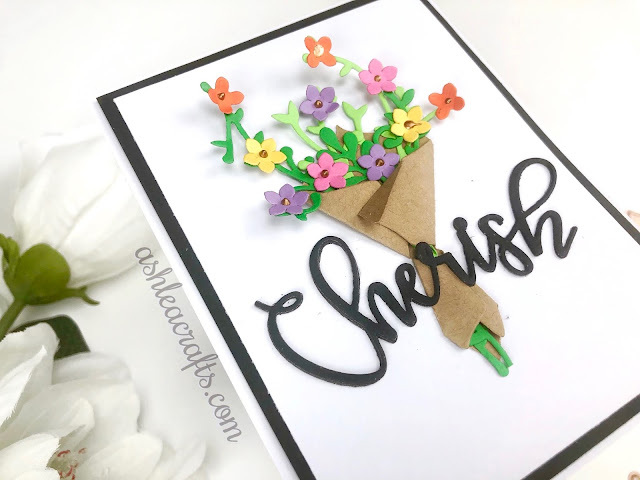 I decided to create a very clean and simple card with the floral bouquet and flower dies in the kit. I thought the 3D image of the bouquet popping off the page created enough interest and I didn't want to draw attention away from it as my focal point. 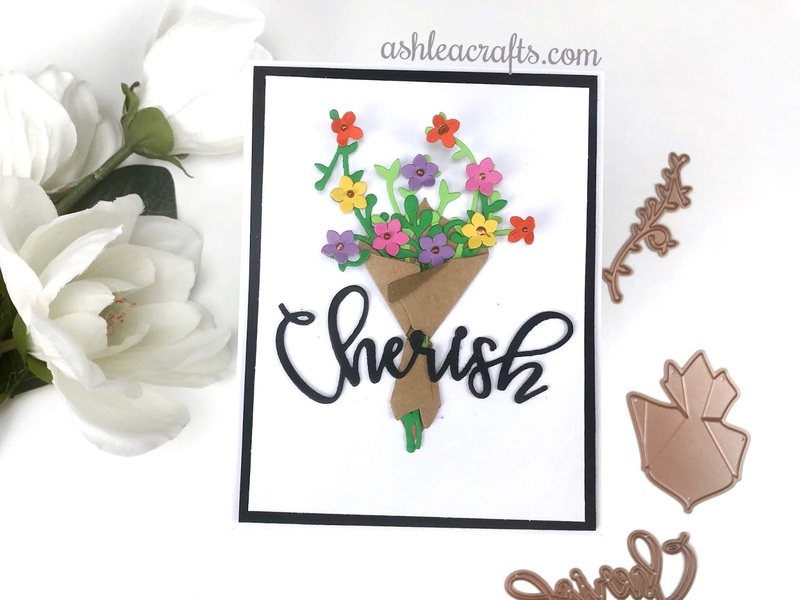 Instead of using the bow die, I decided to use the "Cherish" word die as my sentiment and placed it over the lower half of the bouquet. 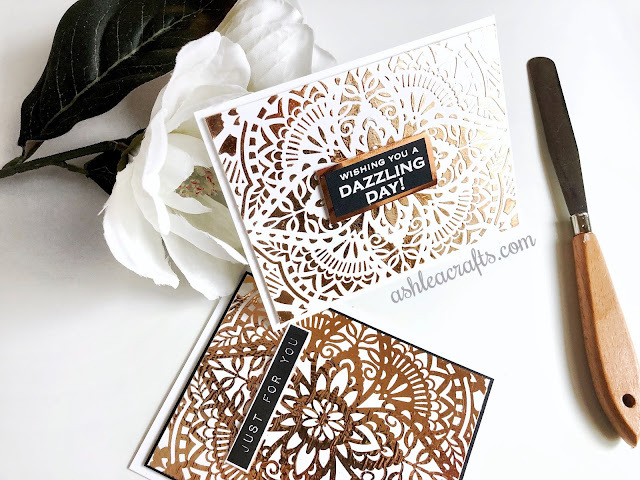 I hope that you've enjoyed learning a bit about how I created this card using the Large Die of the Month from Spellbinders. I can't wait to see what you create with it! Thanks so much for stopping by!